Hey folks, Valkor here. The folks at XSEED can't get enough of the Val-Cave and you know what? The Val-Cave loves it some XSEED, though their latest outing, while leaving me fulfilled, makes me leery for a return visit. I give you "Fragile Dreams: Farewell Ruins of the Moon". 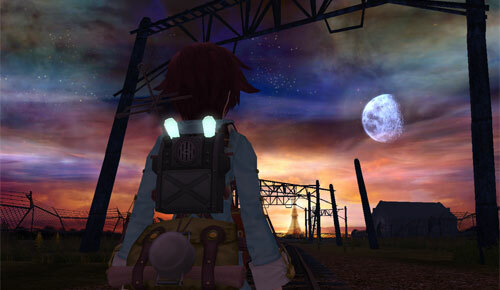 Fragile Dreams puts you in the role of Seto, a young boy who used to live with an old man who passed away. The old man, Grandpa as he's later called, leaves a note for Seto expressing his feelings and where he should go next – towards a red tower. 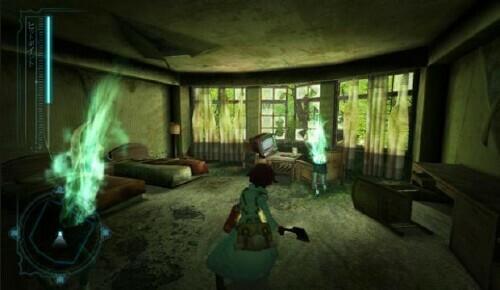 The world of Fragile Dreams is very post-apocalyptic where most everyone seems to have vanished. 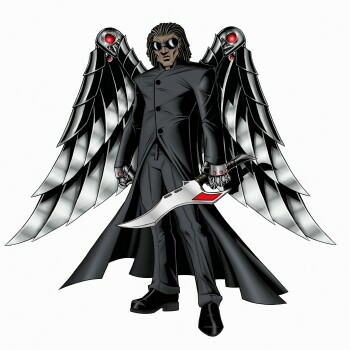 As he progresses through this world he'll come across other characters who will aid him in his progress. 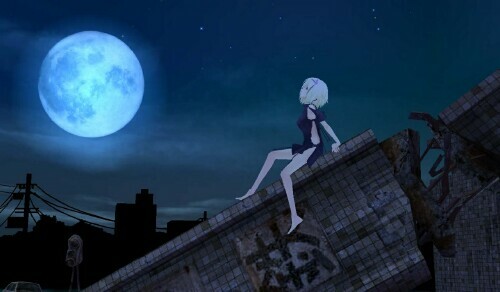 My personal favorite is PF (Personal Frame) who acts as your guide, though her stay won't be long. PF alerts you when enemies are near, where to locate items and people, and is even a great conversationalist. Oh and though PF is just a mechanical, talking box she still has feelings and will express her feelings throughout her time she's with you. The most hated character is Crow, who's just a snot nosed punk and you'll hate em in the beginning because he's so hard to catch. 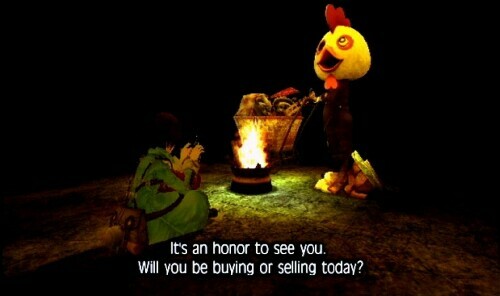 The Item Merchant is another unique character that will pop-up whenever you're at rest. The dude wears a costume and the way you rest is to start a bonfire at appropriate areas (you'll know when you seem it). Plus his appearance is totally random. Finally to help the progression of the story and to learn about what happened to others, you'll find items that you can burn at the bonfire; a spirit will be released and the ghost will tell their story (most are quite chilling, but very insightful). Though you'll battle demons and ghosts, you're not defenseless. First off, you can find weapons throughout, which can be a lead pipe, crowbar, a stick or even a bamboo sword. Of course some weapons are stronger than others but as they do damage they also take damage, so be mindful. The game has limited combos so pressing the A-button in succession will give you stronger combos that will really take out the enemies. Plus some weapons have special features such as the Butterfly catcher that has a long reach and also gives you a spin attack. As you defeat enemies, you'll gain experience and level up plus you can find items such as candy and instant noodles that will rejuvenate loss energy. To buy these items you'll find items that the enemies will drop called "mystery items", (which also contains the spirit items). You'll burn these packages at the bonfire and automatically will exchange the valuable items into money. Finally the bonfire; parking yourself in front of one will refill lost energy, allow you to save your progress and give you access to your briefcase. You're limited to what you can carry when you're walking about so you'll visit the bonfire often to drop off items in your briefcase which has all the room. But don't despair as you progress you'll be given better bags with more space to hold items, which oddly enough all the items fit in your bag like a puzzle – some items fit in long ways and others are squares. The controls are unique and make full use of the Wii-chucks and Wii-mote. For starters you'll use the Wii-mote as a flashlight, which is your main item. Thought it starts out as a bright green dot (the dot stays no matter what). And where you move the Wii-mote, is where Seto will look. 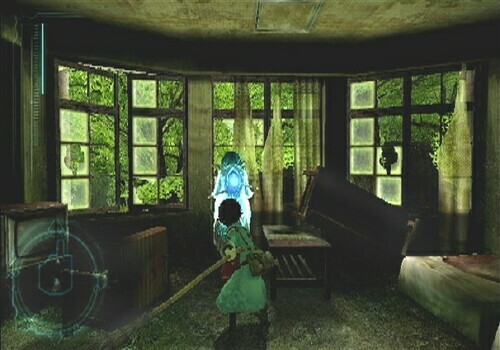 The flashlight also acts as a weapon revealing ghosts that are nearby. And while you're in first-person mode you'll be able to locate items that are important to your progression. You use the B-button to go into first person mode to get a closer look at items that will help your progression. You use the A-button to swing your weapon, weapons which you'll find throughout the game or purchase from the Item Merchant. You're weapons break after use so it's better to stock up whenever you find the merchant because he does show up randomly. The Wii-chuck is used for moving Seto, and the C is for crouching, which you'll have to press again for Seto to stand. Graphically the game uses CGI and cel-shading, which always looks great on the Wii, with some awesome animated cut-scenes throughout. 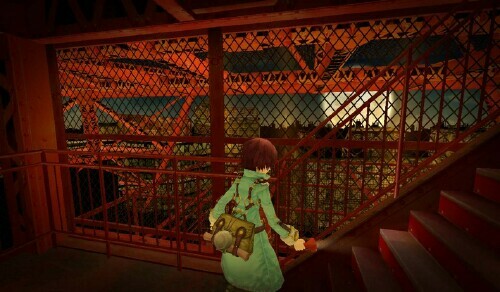 The backdrops are really dismal, but given the post-apocalyptic theme of the game, it's rather suiting. Audio features a ton of voice and a great soundtrack. And I mean a ton of voice. Plus you have some great cinematics that progress the tale. First the story of Fragile Dreams is quite depressing, revolving mostly around death. It's not a horror story but there are some chills. Though depressing as it is, I actually liked the story and enjoyed hanging with Seto along his adventure. 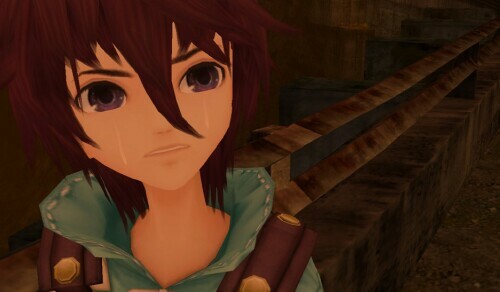 You'll instantly become attached to Seto's world and I dare you not to cry when PF's run in the game ends. The chills kick in when you near an enemy and their growls and taunts come through the Wii-Mote; an excellent touch and really enhances the mood. I love to hate those ghostly legs that taunt the hell out of you! The music is also boss – very cinematic and fits each scene; a big plus is you get to choose between Japanese and English audio (stick with the Japanese, they emote better and the voices fit each character perfectly). Graphically the game is quite beautiful and the backdrops as well as character animation will amaze you. So great job adapting this one XSEED. 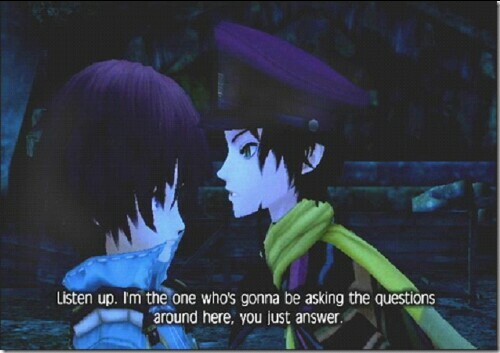 The controls are my only objections and it's a big objections. First off there's no lock on feature, though the Z-button will help keep you in place, you'll have an issue with distance when it comes to attacking enemies as you're not sure how close they are. Plus you can't attack or do much anything in first-person mode, which would help this game a lot. Finally there's a sensitivity issue – move the Wii-mote too quick and the pointer stalls until it rights itself. This is the kind of game that would work better on the PS3 because of the dual analog and shoulder buttons. Freakin Crow!! The most tedious and most annoying part of the story is dealing with that guy. UGH! It just goes on way too long than need be. 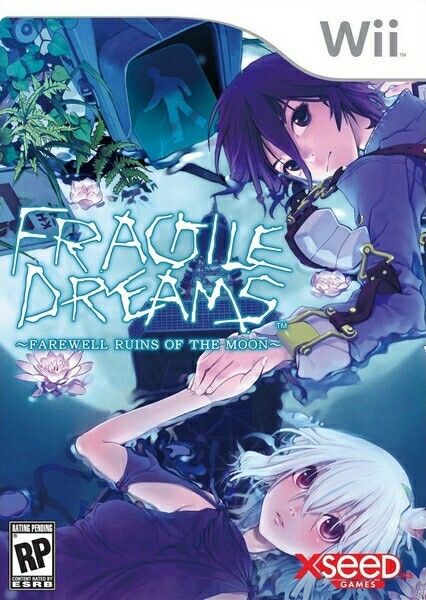 Overall Fragile Dreams – Farewell Ruins of the Moon is a suitable, straightforward action RPG with a wonderful story, a great cast of characters (excluding Crow), and rounding out with beautiful graphics and audio (Japanese… remember that). You know what, controls be damn I'd replay this game again. Out of TOV 5 stars, I give Fragile Dreams a 3.5 and it's been Valkor tested and TOV Approved.